The Robbins Company has secured its first ever Slurry TBM order. In March 2011 Robbins will deliver a 6.26m diameter machine to contractor, Guangdong No. 2 Hydropower Engineering Co, which will be used to excavate the 2.7km long Zhanjiang Bay Cross-Sea Tunnel in southern China. The supply of the machine is a full cooperation between Mitsubishi Heavy Industries Mechatronics Systems, Ltd. (MHI-MS) and The Robbins Company. Robbins will supply components in China, assembly, and local support throughout excavation, while MHI-MS will provide key components and engineering expertise for the Slurry TBM and back-up system. The machine will be assembled in the Robbins Shanghai manufacturing facility. “Robbins fully expects that its entry into the Slurry TBM market will gain quick acceptance, as has been the case with our entry into the soft ground EPB market,” said Lok Home, Robbins President. The machine features 20 thrust cylinders for a total thrust of 46,000kN, a feature needed due to the 6 bar water pressure expected in the bay. A mixed ground cutterhead with hard facing will be fitted with interchangeable knife-edge bits and disc cutters for geology including coarse to abrasive sand, gravel, and silt. To effectively remove the water-bearing ground, a large slurry chamber will combine the muck and bentonite while applying even pressure through the mud screen across the face. Two probe drills, mounted on spherical joints for increased range of motion, will probe ahead and pre-grout depending on the geology and need for intervention. As the machine bores, it will line the tunnel with 450mm thick reinforced concrete segments in a 5+1 arrangement. Active articulation will be used in curves down to a 200m radius, in order to prevent segment deformation. At up to 60m below the water level, the new sub-sea tunnel in southern China promises to ramp up the nation’s steel output. The tunnel is part of a larger fresh water transfer project that will draw from the nearby Jianjiang River to supply a new steel plant on Dong Hai Island. The tunnel will travel beneath the bay with up to 22m of overburden. Once complete in 2011, twin pipelines running through the subsea tunnel will provide fresh water to the Guangdong Steel Plant, a large company with 20,000 employees. The water supply project is part of a plan by the Chinese government to improve the quality and output of steel in Guangdong Province. 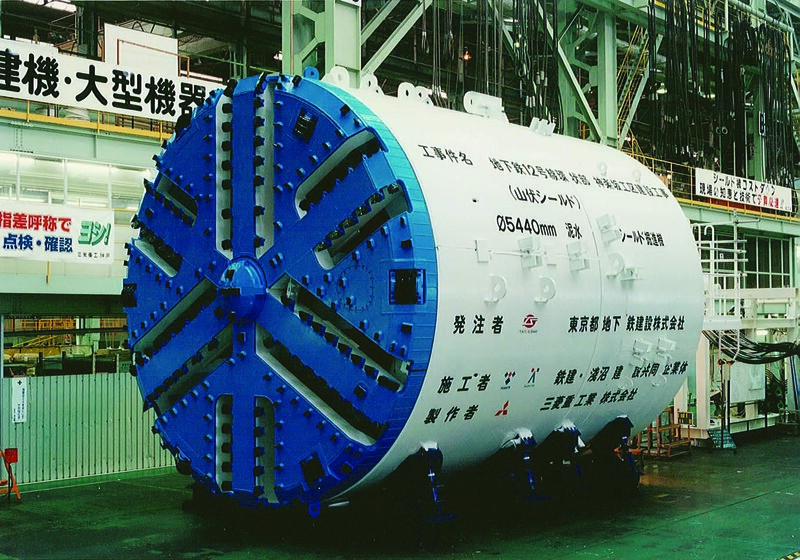 Pic: A 5.44m diameter Slurry Machine for the Tokyo Metropolitan Subway project. Photo Credit: Copyright Mitsubishi Heavy Industries Mechatronics Systems, Ltd. 2010 all rights reserved.